All thirteen-year-old Elsie Wyatt wants is to make it into the exclusive music camp, Shining Birches. But Shining Birches requires "ensemble diversity," and since she missed the auditions for Boston Youth Orchestra while on a family trip to Austria, her only option is to join her high school's marching band. At first she hates everything about it. She's forced out to switch from French horn to the "hateful" mellophone, and within her first day of band camp, she earns an embarrassing name, "Zombie Chicken." But once she starts making friends and getting used to the ordeals that come with marching band, she starts to fall in love with it. Now, if only she keep her mouth shut, or master her audition pieces...then she'd be in business. Reading about Elsie was an interesting experience. Elsie is a driven, borderline prodigious French horn player that was so obsessed with practicing that she never bothered to make new friends when her old best friend moved away-the opposite of me, in some ways, which made her a good character to read about. Sometimes, the things she said to her friends made me cringe...but by the end of the book, she seemed to want to be nicer, so it wasn't like she went unchecked the entire book (a pet peeve of mine, by the way). The plot line was great. Like I said before, finding a marching band book is rare, and this one was a treat. 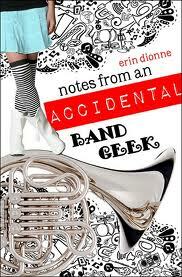 The crazy band antics made me laugh, and the more serious subplot about her dad was well-written, too.